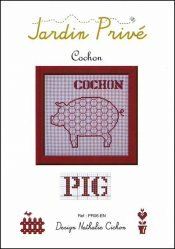 Cochon (Pig) [J1795] - $5.00 : Yarn Tree, Your wholesale source for cross stitch supplies. Cross stitch pattern by Jardin Prive. A little pig with chicken wire in the center. Stitch count 82w x 78h. Can be stitched with H5123 (Chicken) and D7033 Lapin (Rabbit).